Upgrade your next reunion, wedding, corporate event, bat mitzvah, or house party from fun to unforgettable by setting up a professional-style photo booth. You don’t need tons of expensive equipment or an enclosed box with curtains; you just need a camera, minimal lighting and background supplies, and some willing participants. These instructions are for a basic booth, but it can be modified and personalized. Share your own tips and recommendations in the comments. First and foremost, you will need a digital SLR camera and a tripod. Since you’re shooting stationary subjects with a strong flash, you don’t need a high-end camera to get good images—most consumer level DSLRs will work. For this example we used my trusty Nikon D40. Start with a flat white or gray background. You can use a blank wall, muslin or fabric (which give a textured effect), or for the best results, seamless background paper. These inexpensive rolls of paper are typically held up by a background support system (two stands and a crossbar). “A” clamps are used for keeping the backdrop from unrolling too far, and for weighing it down on the floor. You can get seamless backdrops in almost any color, but be careful not to overshadow your subjects. Simple and clean is usually the best bet. A monolight is an all-in-one strobe flash unit that plugs directly into a the wall via an AC power cord. For these basic shots you need a 150 watt/seconds monolight or stronger. A small soft box goes over the monolight, diffusing the light to create a flattering effect. The assembled unit mounts on top of the adjustable light stand. The sync cord connects your camera to the monolight. If you have one of the many consumer-level DSLRs that don’t have a PC sync port, get a compatible hot shoe to PC sync adapter. 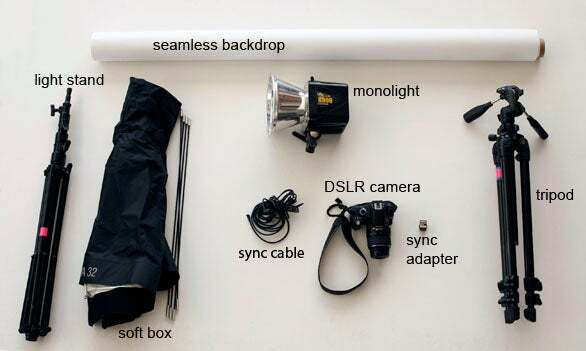 You can buy most of these items together in a monolight kit. The cost of this type of kit starts at $160 (not all kits include sync cords). 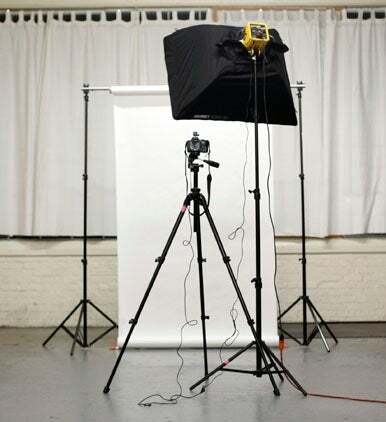 If your photo booth is going to be a one-time-only affair, consider renting a light kit from a local camera store like Calumet. Rentals start at around $25 per day and the rental desk will even show you how to set it up. Most monolights have an infrared receiver that can be triggered wirelessly by your on-camera flash, but this doesn't work very consistently. A better option for working wirelessly is to invest in wireless radio transmitters which trigger the flash without requiring a direct line-of-sight. If you want to take your photo booth to the next level, you can add additional lights. Extra flashes can be pointed at the background to eliminate shadows and fill lights can be used to eliminate any strong shadows on your models. Hot shoe flashes work great for both of these. Pick a spot against a wall, near an outlet, and away from too much traffic (one errant foot could bring your lights crashing down). If it’s daytime, you can set up next to a window to take advantage of the natural light. Set up your backdrop, move three feet in front of it and tape an X on the ground. This marks the general area where people should pose. If you want shadows behind your subjects, move the marker closer to the background. If you prefer less shadow, bring it closer to the camera. The camera and soft box will be approximately the same distance from your subject. What that distance is depends entirely on how you want to compose your photos. If you have space, full body shots are great for capturing colorful outfits and giving people room to goof around. A tighter crop (waist up) gives you that old-school photo booth feel and it works great in cramped events. When you’re shooting with just one light, shoot your subjects straight-on to avoid unflattering harsh shadows. A good rule of thumb is to line up the bottom edge of your soft box up with the subject’s chin and place the camera directly below that. This should give you even lighting with just enough defining shadows. The top image was taken with one light, the second with an additional fill light pointed at the background, and the third with props. While you can set your camera to automatic, the results won’t be consistent from person to person. For optimal images turn the dial to Manual, set your aperture to F8, and your shutter speed to 1/250 (this is the maximum sync speed for most DSLRs but make sure to double check your camera’s documentation). If you have a hand held light meter, use it to test your lights and go by its recommended settings. Next, look at the test images and tweak your aperture until you have your desired look. Give your photo booth extra appeal by shooting tethered to a laptop. Each image will instantly pop up on your screen much to the delight of your guests. This is also a handy arrangement if you want to save images directly to your hard drive instead of swapping out memory cards all night. It’s best to have the screen facing away from the set, or else you’ll have a party’s worth of pictures with everyone looking distractedly off to the side. You can use programs such as Adobe Lightroom and Aperture in conjunction with your camera’s proprietary software to shoot tethered. Each camera is different, but typically you must set it to PTP (Picture Transfer Protocol) and connect it to your computer over USB or Firewire. For detailed instructions on shooting tethered, visit your camera manufacturer’s site. Unless you are working as a paid photographer, chances are you would like to mingle and enjoy your event instead of being glued to the camera. One fun option is to use a wireless remote for your camera. Guests can take their own photos with the press of a button. Remote controls are affordable, especially if you go the generic route. Another highly recommended photo booth addition is props. Yes, props. Put out a box of hats, boas, sunglasses, fake mustaches, silly outfits, and whatever else you can find. Your subjects will take much more relaxed and entertaining pictures. Now you just need to post your images to an online gallery like Flickr, Picasa, or Facebook and share the goods.